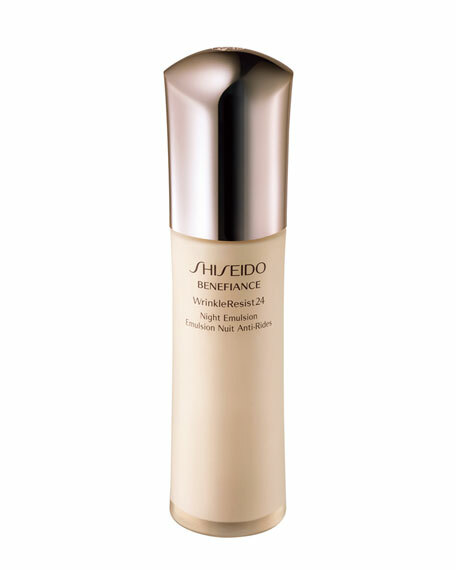 Shiseido Benefiance WrinkleResist24 Night Emulsion, 2.54 oz. ShiseidoBenefiance WrinkleResist24 Night Emulsion, 2.54 oz. An age-defying nighttime moisturizer that intensively addresses lines and wrinkles before they become more serious, this emulsion offers visible reduction in the appearance of wrinkles and helps promote silky smooth skin condition while encouraging recovery by morning. Newly reformulated, Shiseido Benefiance WrinkleResist24 targets every step of wrinkle formation for youthful looking skin that can resist signs of aging. The entire line contains a revolutionary breakthrough ingredient, Mukurossi Extract, which directly inhibits the activity of a wrinkle-triggering enzyme. Skin is made resistant to future signs of aging while existing signs of wrinkles are visibly improved. 2018 Glamour Award Winner for Best Designer Serum Powerful nighttime renewal for radiant, youthful-looking skin. Instantly adds radiance. Intensely hydrates.